Delia Latham is a born-and-bred California gal, currently living in East Texas with her husband Johnny. She’s a wife, mother, grandmother, sister, and friend—but above all, she treasures her role as princess daughter to the King of Kings. 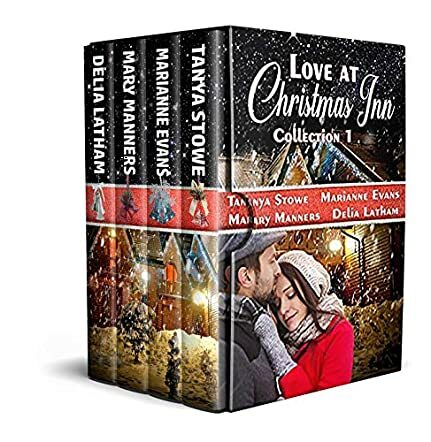 The Love at Christmas Inn Collection includes four individual books with four separate stories of love at Christmas Inn. The stories happen simultaneously or within the same short time frame. Four different individuals associated with the magical and sometimes mysterious Christmas Inn are the focus of these engaging stories. This delightful set of easy read books will allow you a glimpse at these four talented writers who have published numerous other books, some of which are bestsellers. The collaboration of Marianne Evans, Delia Latham, Mary Manners and Tanya Stowe to write this collection is a good one. Their styles complement each other and provide a blending of events that will surely charm you. In Tanya Stowe's Christmas Bells are Ringing, the Inn is in disrepair and is undergoing renovations. The owner’s daughter, Ariana Christmas, has been sent to the Inn to take care of her ailing Aunt Lizzie and to hopefully spark a sense of responsibility in this otherwise spoiled woman. She remembers the happy times growing up and staying at the Inn. She is determined to help bring the Inn back to its former glory and jumps right in. Taylor Knox, head of the construction crew doing the renovations, is a pleasant surprise. As a relationship develops, Taylor tries to run from it, but can he? In Marianne Evans's Bells at Midnight, due to a snow storm and car trouble, Graham Forrester finds himself stranded at Christmas Inn. Lydia Cutler is working at the Inn and their first meeting makes a big impression on both. As mutual feelings quickly develop, life and career choices have to be made. Graham has been offered the job of his dreams in Atlanta, but can he leave his heart behind in Tennessee at the Christmas Inn? Can love really happen so quickly? What does God want? In Mary Manners's With Bells On, Emmy Lancaster has agreed to come to Hope Creek to do a holiday show for her Aunt Dahlia’s theater. She will be staying at Christmas Inn, a place that holds fond memories of her youth. She fell in love at Christmas Inn seven years before, but decided to pursue Hollywood. She left Jayson behind, but she is about to be confronted with her past and she will have decisions to make. Can an old love be reignited and does she want it to be? Could Emmy be happy in Hope Creek or will she head for the coast as soon as she can? In Delia Latham's Bells On Her Toes, Karynn Michaels has not found love since her high school sweetheart, Daniel, moved away ten years ago. This year, her sister, Savannah, is taking her away to the Christmas Inn for her Christmas Eve birthday, where she hopes that Karynn will relax and remember how to play a little. Whether by chance or divine intervention, a widowed Daniel Sheridan is also at the Christmas Inn with his daughter and her nanny. When these two childhood sweethearts reunite, it is as though time has stood still. All of the same feelings come rushing to the surface for both of them. Can they pick up where they left off or has too much happened in the last ten years? Love at Christmas Inn is all about love. Not always easy, not always obvious, but love that conquers circumstance and time. The Christmas Inn is picturesque and sentimental, all the things you would want for a romantic, cozy holiday in the wintry snow. The bells in the chapel’s steeple ring on occasion, but only when someone has found true love. When true love shares a kiss at Christmas Inn, the bells announce it, without man’s assistance. A cup of hot chocolate, a warm fire, and your imagination will usher you into the dreamy place that is called Christmas Inn. No reservation required.